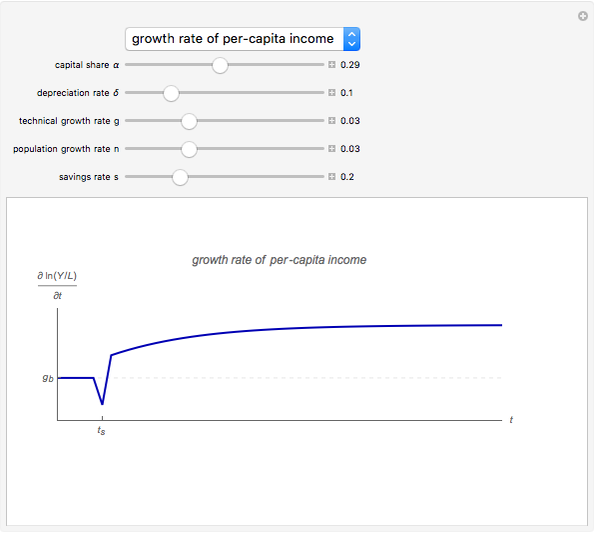 The Solow–Swan model is a simple neoclassical growth model. 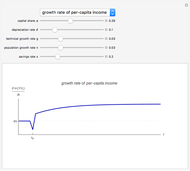 It postulates that growth of per-capita output is the result of capital accumulation and/or technological progress. 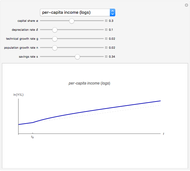 As soon as the economy reaches its steady state, per-capita output growth is only possible via technological progress, which is exogenous in the model. It is convenient to represent all aggregate variables in quantities per effective labor (i.e., labor augmented by the technology level) because the steady-state capital per effective labor is constant. As shown with "long run equilibrium", this steady-state level is determined by the intersection of the savings and the break-even investment curves, and , respectively. Furthermore, the golden rule capital is the level of capital for which consumption is maximized. If any model parameters are changed by exogenous shocks at time , a new equilibrium ensues and can be compared to the baseline scenario (denoted by the subscript ) associated with the original parameter values. In addition to this comparative static analysis, the five other graphs show the model dynamics illustrating the adjustment process that leads to the new equilibrium. 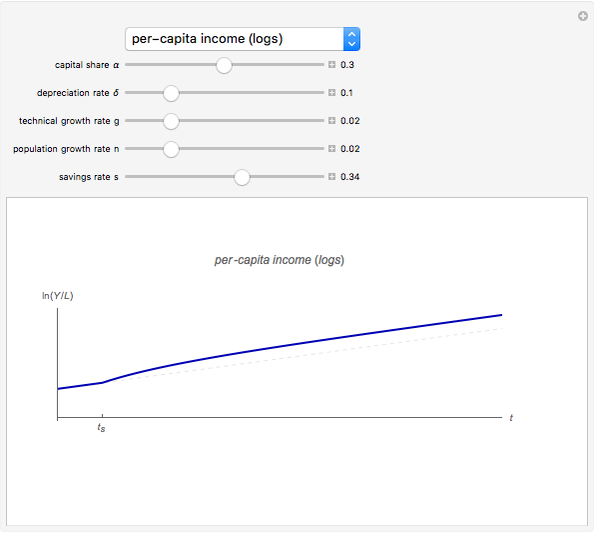 Formally, the main aspects of the Solow–Swan model can be derived from the differential equation that describes capital accumulation: . 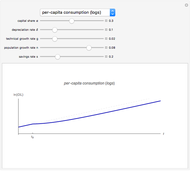 Capital (per effective labor) accumulates if the proportion of output saved (and thus invested) is higher than the break-even investment, defined as the amount of capital needed to cover depreciation , population growth , and technological progress . In the steady state, capital per effective labor is constant by definition and hence . The standard Cobb–Douglas production function is used in this Demonstration, so its intensive form is defined as , where is the elasticity of capital. 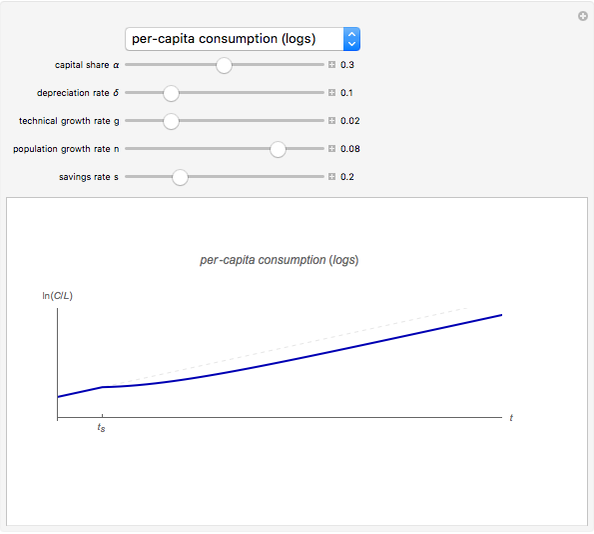 It is evident from the model dynamics that only a change in the rate of technological progress has any influence on the long-run growth rate of per-capita output and consumption. For any other parameter change, the growth rate eventually converges back to the original value of . R. J. Barro and X. Sala-i-Martin, "Growth Models with Exogenous Saving Rates (The Solow–Swan Model)," Economic Growth, 2nd ed., Cambridge, MA: MIT University Press, 2004 pp. 14-58. D. Romer, "The Solow Growth Model," Advanced Macroeconomics, 3rd ed., New York: McGraw–Hill, 2006. R. M. Solow, "Contribution to the Theory of Economic Growth," The Quarterly Journal of Economics, 70(1), 1956 pp. 65–94. T. W. Swan, "Economic Growth and Capital Accumulation," Economic Record, 32, 1956. Richard Foltyn "Dynamics in the Solow-Swan Growth Model"